Saturday was Halloween and the possibility of an uninterrupted, sit-down dinner were slight. I decided to make pocket breads to have a “grab and go” meal, between trips to answer the front door. A new variation of a bierock was the obvious answer. Bierock are Volga German stuffed breads. The Volga Germans were brought into Russia by Catharine the Great for their “modern” technical skills. However, their cooking was not one of those skills. Many would consider both German and Russian traditional cuisines a wasteland—there is only so much you can do with cabbage flour, potatoes and a little beef when you do not have access to, or can afford, fancy spices. While Jan likes my bierock, she is not overly fond of beef. She does, however, like chicken apple sausage. I could have uses smoked sausage, but I decided that fresh would be better. I could add more flavors to the meat and then use the browning technique that I learned from America’s Test Kitchen. This is really a California Fusion of the original recipe. Note: An America’s Test Kitchen chef found the solution to the problem of tough meat vs well browned flavor. (I can’t seem to find the reference—it might have been an episode I watched on TV.) She found, that if you break up the meat and brown it, you end up with lots of flavor but tough, chewy bits of meat. If you simmer the pork in the sauce you may have tender pork, but very little flavor. The solution is to fry big patties of meat. The outside gets the flavorful browning, but the inside meat stays tender. Breaking up the patties and returning the meat to the pot give you the best of both worlds. The first time I made bierock I divided my dough into 16 pieces. While this made a lot of bierock, the bread layer was very thin. I increased the amount of dough by 25% and divided the dough into only 12 pieces. This produced a thick breaded bun that could be a full meal, just by itself. After Dinner Note: Eilene and I were quite satisfied with only one bierock apiece. Jan ate two. She really liked them. 1. Put the yeast in the warm water with a good pinch of sugar. Stir and let it proof for 10 minutes. 2. Sift 3½ cups of flour, salt, and two tablespoons of sugar together several times to get an even distribution of the ingredients. Note: Reserve half a cup of flour for dusting the board while you are kneading the dough. Tip: You may do this is a small pan, but I simply use a two cup measure and microwave it until it just boils, about two minutes. 4. Cut ¾ of the stick of butter into pats and add them to the milk. Tip: The heat of the milk melts the butter and the butter cools of the milk quickly. Freezing your butter stick make this more effective. Note: The point here is to cool the milk enough, so that the egg does not turn into scrambled eggs when you add it to the warm milk. 5. Whisk the egg into the milk. 6. Make a “well” in the flour and add the yeast water and the milk/butter/egg mixture. Note: The scalding of the milk and the butter binds the proteins preventing some of it from forming gluten and produces a softer bread. 7. Pull the flour from the sides of the “well” into the wet ingredients. 8. When the flour in the bowl is mostly incorporated, turn the dough out onto a well-floured smooth surface. Note: The butter tends to make the dough less sticky and your will need only a little extra flour to knead the dough. 9. Knead the dough for 10-15 minutes until the dough is smooth and elastic. Tip: If your dough has just a touch too little liquid it will become very difficult to knead the dough after five minutes. If this happens put the dough in a bowl covered with a damp cloth and let it rest for ten minutes. 11. Add one tablespoon of melted butter to the bowl you mixed the dough in and rub the top of the dough ball in the butter. 12. Turn the dough over and cover the bowl with a smooth, clean, damp, kitchen towel. Place the bowl in a warm place for one hour. 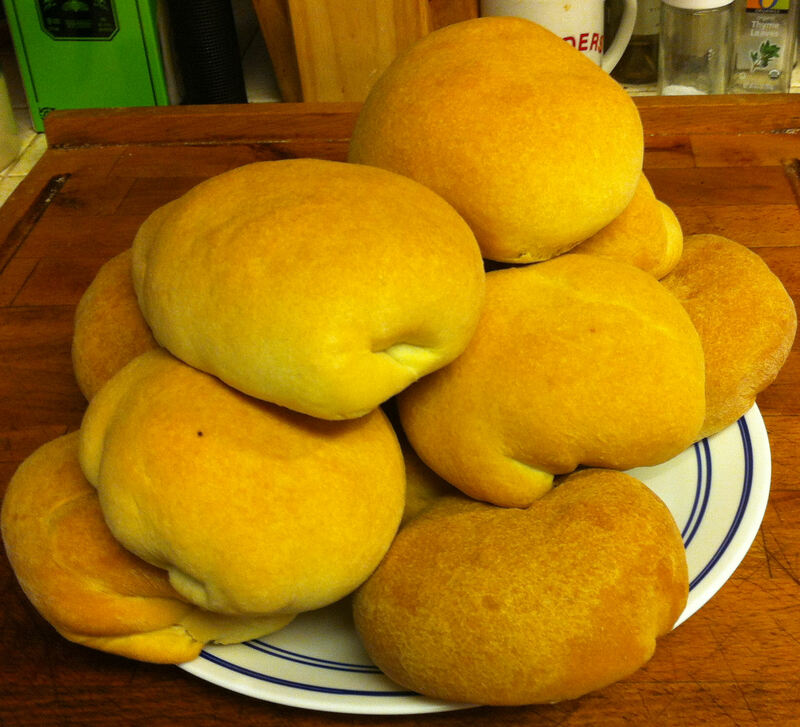 Tip: If you use a terrycloth towel, the dough might stick to it as it rises and be hard to remove. 13. Remove the chicken sausage from the casing. Tip: I am using fresh sausage for this dish, so I can get a good browning on the meat without over cooking the sausage. Note: You may use smoked sausage, by dicing it up and frying it lightly. You would have to skip adding the additional sausage ingredients or you may add them to the pan when you cook the vegetables. 14. Mix the soy sauce, thyme, black pepper, and salt to the raw sausage and mix them well with a spatula. Tip: Pull your spatula through the meat in long pulling motions. In addition to mixing in the ingredients, this causes the protein fibers to link together in long strings. This is what turns simple ground meat into sausage. 15. Let the chicken marinate for 20-40 minutes. 17. Form the chicken into a single large patty, about half an inch thick. 20. Remove the meat to a plate to cool. 21. Add the onions, celery and salt to the pan. Sauté until soft, about five minutes. Tip: Use the moisture released by the vegetables to deglaze the pan. Make sure to free every bit of fond. Any bits that stick to the pan could burn and spoil your dish. 22. Stir in the cabbage and the dried apple. 23. After the vegetables have started to cook down, about five minutes, pull the vegetables to the sides of the pan. 24. Add the garlic to the hole in the center of the pan and sauté the garlic for one minute, until fragrant. 25. Stir in the wine, thyme, and pepper. 26. Continue cooking the vegetables until soft and most of the wine has evaporated. 27. Break the chicken patty into small bits and stir them into the vegetable mixture. Tip: Scrape any juices on the plate into the pan. 28. Put the lid on the pan and let the mixture cool for 10 minutes. 29. Stir in the parsley and leave the pan uncovered. 32. Take a dough ball with the “crimped” side up and roll it into a disk about 7 inches in diameter. Tip: I do this in two stages. I role several dough balls into four inch disks and then let them rest for a few minutes. This gives the gluten a chance to relax and adjust to its new shape. I then roll out the outer inch of the disk to make a seven inch disk with a thicker area in the middle. Note: I have found that when I rolled out my dough into a flat disk, the tops of my bierock came out very thin and the bottoms—where the edges of the discs were gathered together—ended up very thick. 33. Place a quarter cup of filling in the center of the disk. Tip: The meat mixture in the pan is fairly loose. I found that by using a spatula and a quarter cup measure I could pack the filling down and place it in a tight packet in the middle of the dough. This made it easier to wrap the dough around the filling. Tip: Pick up the two opposite edges of the dough and pinch them at the top with one hand. Pick up the other two edges and bring them to the top. You will have four folds of dough sticking out from the sides. Pull each of these to the top, in turn and pinch and twist them together. Lay the bierock on the counter sealed side down and cup your hands around it and gently rotate the dough to further twist the gathered edges. Use your hands to gently form the dough into an even “bun” shape. 36. Brush the tops lightly with melted butter. 37. Let the bierock rise for 20 minutes. 28. Bake for 25-30 minutes in a preheated 375º F oven. Tip: Rotate the tray after 15 minutes, so they cook evenly. 39. Transfer the bierock to a wire rack for 10 minutes to cool and eat warm or cold.